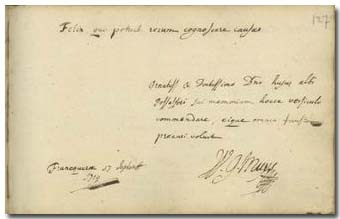 Pápai Páriz Ferenc, Album amicorum p. 127. * Virgil, Georgica 2.490. In the English translation by J. B. Greenenough: “Happy, who had the skill to understand / Nature's hid causes.” Also quoted by János Csúzi on p. 339. I intend to recommend myself into the memory of the eminent and learned possessor of this album with this short verse, and wish him all the best things. In Franeker, on September 17, 1719. Wyer Gulielmus Muys (Wijer Willem Muijs) was born on January 5, 1682 in Steenwijk (Overijssel), a son of Mayor Johannes Muys and Maria Schulting. He studied in Leiden, received his doctoral degree in 1701 in Utrecht, and practised in Arnheim. In 1709 he was appointed professor of mathematics at the university of Franeker, and in the same year he was elected member of the Scholarly Society in Berlin. Later he also became professor of medicine, chemistry and botanics. He died on April 19, 1744. His works also indicate his versatile talent: Elementa physices methodo mathematica demonstrata, quibus accedent dissertationes duae de causa soliditatis corporum et de causa resistentiae fluidorum. Amsterdam, 1711. – Dissertatio & observationes de salis ammoniaci praeclaro ad febres intermittentes usu … Franeker, 1716. – Investigatio fabricae quae in partibus musculos componentibus extat … Leiden, 1741. – Diss. II de materia luminis, seu ignis, caloris et lucis natura. – Or. inaug. de usu matheseos in perficiendo judicio & ingenio, Franeker, 1711. – Oratio inauguralis de theoriae medicae usu atque recta illam excolendi ratione … Franeker, 1714. – Infundibulum grammaticae Latinae sive LI ecercitia Latina et Germanica … Berlin, 1732.